This morning, I got up at 4.30am and took a bath. At 5am, I already dressed up. But then I thought I might need another hour to sleep (as I only got 4 hours of sleep last night since I stayed up until 12.30). As stupid as I was, I forgot to set up my alarm. I woke up at 7.47. I had a class at 8.50 and I needed at least 30 minutes to dress up (again) and an hour to go to campus. Long story short, I arrived at 9.53. I knew the teacher's assistant would let me in, but I decided not to even try. Everyone in the class would laugh at me for showing up that late. I couldn't take it. So there I was, sitting next to a big window, looking at the parking lot. I really have to stop my bad habit of staying up late at night, Tumblr-ing. 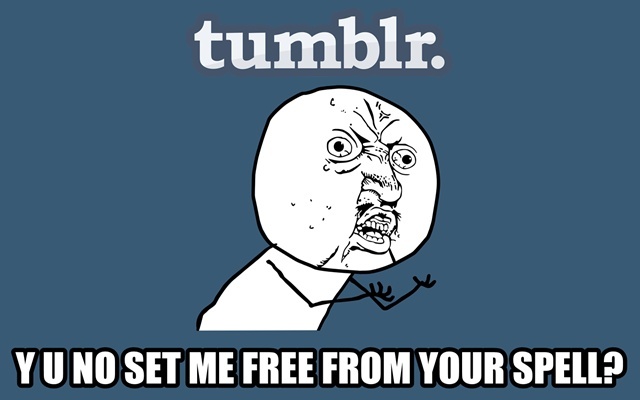 Please set me free from your spell, Tumblr!